Ft Worth Avenue Bike Lanes Happening Now! Those are real bike lanes going down on Ft Worth Avenue from Sylvan to Edgefield! What you see is the pre-striping outline of the bike lanes that will hopefully be painted today if the weather holds. This project is a joint effort of the Ft Worth Avenue Development Group, Bike Friendly Oak Cliff and the city of Dallas. A year ago today the project began, see here for a reminder. A big thank you to all the supporters of the project, city leadership from council members Monica Alonzo and Scott Griggs and staff member Keith Manoy for making this happen. The bike lanes will be buffered, thus providing greater protection for cyclist. BFOC and Ft Worth Avenue Development Group will be documenting the improvements to the corridor over the coming months, such as improved safety through reduced vehicle speeds, a survey of bicycle and pedestrian users and quantification of economic impact to local businesses. Both groups will also be hosting group rides and maybe even a better block to celebrate! The bike lanes may seem like they don’t go very far or connect anything right now, but they are part of a network of improvements that will bolster current assets, such as Coombs Creek Trail with future ones like the Trinity Trails that are currently under construction, see here. The current project highlighted in orange below will connect with the Kesler Neighborhood of North Oak Cliff via Edgefield and Sylvan Avenue, which will be completed later this year. 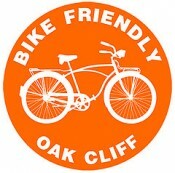 2013 is going to be a great year for the bicycle in Oak Cliff and West Dallas, more to come! Count dates for 2013 are Jan 8-10. Let’s get in on this and put Dallas on the map! I have trained college students how to properly count and have the training presentation ready for when a group wants to get out and count for a day!